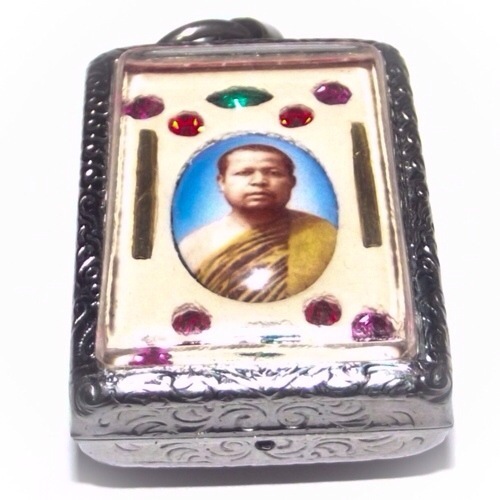 Taep Jamlaeng Butterfly King Amulet – with blue Kroo Ba Krissana Intawano Cameo Locket, 14 Maha Pokasap Gems (4 in the front face, and 10 in the rear face), and 2 Takrut spells inserted. Made in 2553 BE for the ‘Lai Sen’ edition (now a more famous and highly preferred edition), by Kroo Ba Krissana Intawano. Fancy stainless casing is included with this item. The casing is special quality, with engraved patterns gracing the edges. 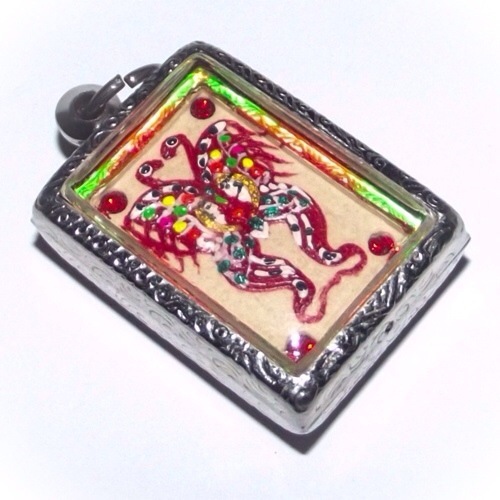 The front face of the amulet features the Taep Jamlaeng Butterfly King, with red, green, yellow, orange and white finely painted details. 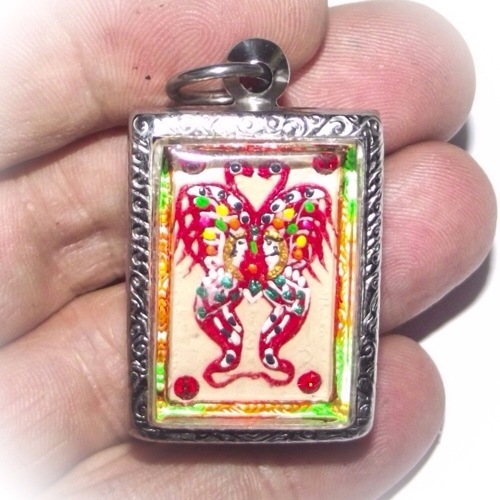 The Amulet is a most delicately painted miniature Objet D’art. 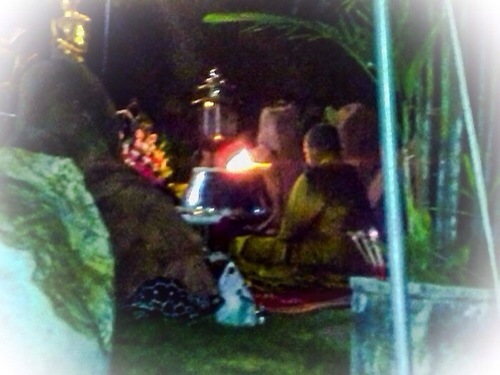 Four Ploi Sek Maha Pokasap Gemstones are inserted. 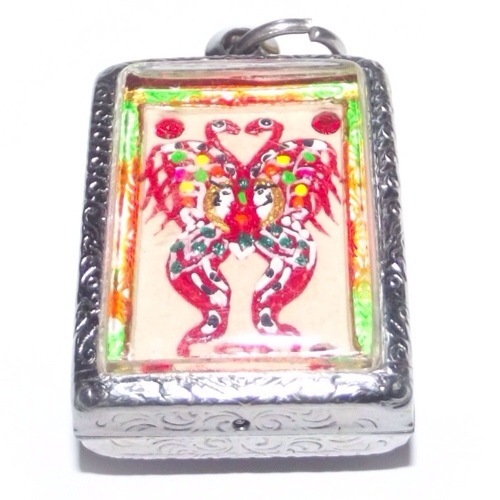 The rear face of the amulet has a locket, 10 gemstones, and two Takrut inserted into the Muan Sarn Sacred Powders. 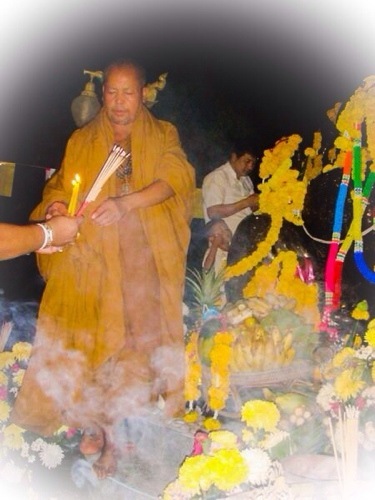 Kroo Ba Krissana Intawano is along with his accomplice Kroo Ba Beng, of Wat Tanode Luang, one of the only two surviving holders of the secret Wicha of their Kroo Ba Ajarn Guru Master. 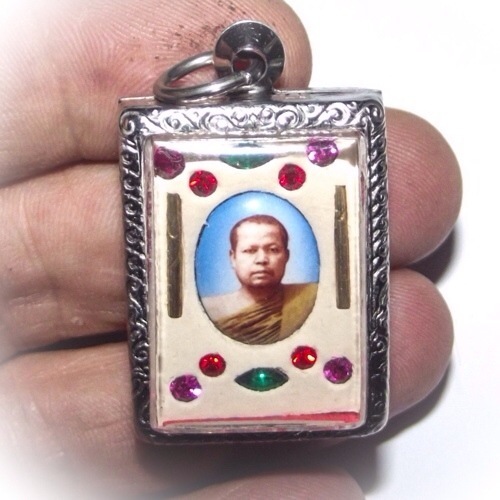 Namely that of the special method of successfully making Taep Jamlaeng Butterfly King Amulets, whose power is derived from both the psychic and Deity assisted empowerment, as well as from the secret aromatic admixture of Muan Sarn Sacred Powders, Maha Pokasap Gems (ploi sek), and Takrut spells. This particular model is a ‘Pim Klang’ (medium sized) Ongk Kroo Masterpiece Version. It is extremely fortunate now to find what still available some years after the release of the addition. This is because, his amulets are nearly always completely sold out in every edition, before the year is over. This shows the great popularity and collectability and speculating value of his amulets and how sacred they are to so many people. 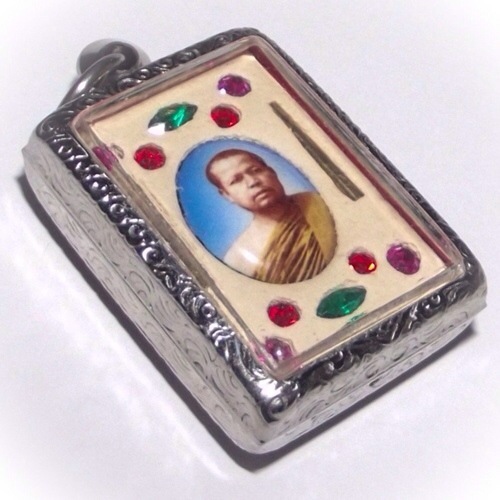 May consider, that we can still find amulets of great historic masters so many tens of years and even hundreds of years after that passing, but with the amulets of Kroo Ba Krissana Intawano, only one year is needed for an edition of his amulets, to appear to be completely depleted. Each series and edition depletes and disappears shortly after their appearance. This is what we call a true phenomenon. 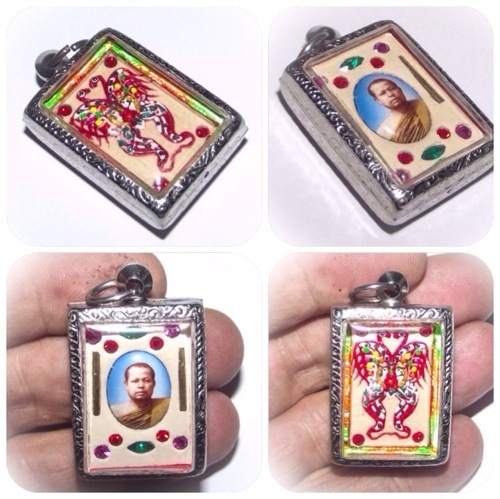 These Butterfly King amulets, were released in a series along with some special coin metallic Amulets.